SmackDown does its second-best total of 2019, the latest notes on the WrestleMania card, TJ Dillashaw relinquishes the bantamweight title, more analysis on the UFC-ESPN+ deal & more. **On this week’s Rewind-A-SmackDown, my guest co-host is Brian Mann. On the show, we discuss the build-up for WrestleMania, the Kofi Kingston gauntlet match from Tuesday, The Miz’s promo, and lots more from the show. Plus, Brian shares some stories from his time with WWE in 2011 when the WWE Network in its early stages of development with plans that were on the table. **We also have the Double Shot up for members of the POST Wrestling Café. I am solo on the show this week going through Road to Double or Nothing, Being the Elite, Impact Wrestling, MLW Fusion, and my solo recap of Total Bellas focusing on the Evolution event from last October. **Finally, we have an interview up on the site with ESPN’s New York Ric to chat all the latest MMA news. We covered the news involving TJ Dillashaw relinquishing the bantamweight title and what it means for the division, the UFC’s new deal with ESPN+, Jorge Masvidal’s star power following his win over Darren Till, the UFC’s welterweight division, Stephen Thompson vs. Anthony Pettis this Saturday, and the legacy of Michael Bisping. This show can also be heard through the POST Wrestling on iTunes, Spotify, Stitcher, Google Play and wherever you get your podcasts. **Later today, we will have a new edition of the British Wrestling Experience with Martin Bushby and Benno joined by Jamesie to chat wXw’s 16 Carat Gold tournament, OTT’s Scrappermania 5 card and lots more U.K. news and shows. **On Thursday, I’ll have an in-studio chat with Damian Abraham, which will be up in place of the Café Hangout. Plus, we will have a new edition of upNXT with Braden Herrington and Davie Portman. **Last call for questions for this Friday’s Ask-A-Wai mailbag show as Wai Ting joins me from Hawaii. **We are just over two weeks away from our POST Wrestling LIVE in New York show. Wai Ting and I will be at the Broadway Comedy Club for a special Q&A show on Sunday, April 7th in New York City. The Q&A will take place at Noon and be a 90-minute show with two options for the meet-and-greet at 11 am and 1:30 pm before and after the Q&A. Tickets are available now at https://www.postwrestling.com/live/ with a look at our exclusive POST t-shirt that will be sold at the show. 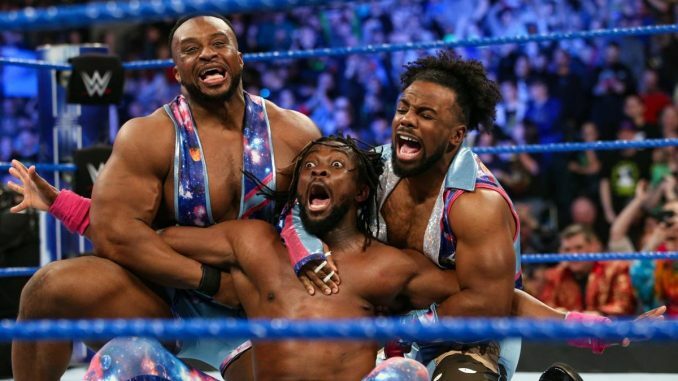 **Tuesday’s episode of SmackDown Live built around the hour-long Gauntlet match featuring Kofi Kingston did the program’s second-best viewership number of 2019. The show averaged 2,208,000 viewers on the USA Network. It was their highest average since February 19th, which was their best number of the year. **The latest additions to the WrestleMania card include a United States title match between Samoa Joe and Rey Mysterio. They are teasing an angle with Mysterio’s son Dominic announcing he will be sitting in the front row. The Cruiserweight title match is set after Tony Nese defeated Cedric Alexander in the finals of the tournament to face Buddy Murphy. It was also announced Tuesday night that a fatal four-way match will take place on SmackDown next week involving Naomi, Carmella, Mandy Rose, and Sonya Deville with the winner facing Asuka. We have been told there will be a SmackDown tag title match and a women’s battle royal on the show. The SmackDown tag title picture has no shortage of teams with The Usos as champions, The Hardys, New Day, and Aleister Black & Ricochet among the options. John Cena is also scheduled for a role on the show, which could be a match or getting involved in a segment with some physicality. As of Tuesday, the plan is for Kurt Angle to face Baron Corbin at WrestleMania despite acknowledging on television that the fans are upset with Corbin being in the match. This was reported Tuesday by both the PWinsider and Wrestling Observer outlets and I was told the same. The notable names without a direction are Kevin Owens, Mustafa Ali, and Andrade. It’s going to be a big lineup by the end because of the volume of singles matches. Of the ten matches announced, eight are listed as singles matches. That doesn’t include the matches between Daniel Bryan and Kofi Kingston or Roman Reigns vs. Drew McIntyre, which haven’t been announced yet. **The semi-finals of the New Japan Cup will take place Saturday with Kazuchika Okada facing Tomohiro Ishii and the winners of Thursday’s matches. The final is on Sunday with the winner set to challenge Jay White at the G1 Supercard at Madison Square Garden on April 6th. **Tonight’s episode of NXT is built around Paul Levesque’s announcement regarding Tommaso Ciampa’s injury and setting up the NXT title match for TakeOver in Brooklyn. **Brody King has announced that he will be unable to travel to the U.K. this weekend for the IPW group. King broke his hand earlier this month in Australia while on tour for WSW. King did wrestle this past weekend for Ring of Honor but has been told to limit his travel so his hand can heal. King is scheduled to team with PCO to take the Guerrillas of Destiny at the G1 Supercard on April 6th with both the ROH and IWGP tag titles on the line. **The main event has been announced for Josh Barnett’s Bloodsport card with the event’s namesake taking on Minoru Suzuki. Game Changer Wrestling has also announced that Bloodsport is now sold out at the White Eagle Hall in Jersey City. The show takes place Thursday, April 4th at 4 pm and will also stream on Fite TV. **Game Changer Wrestling has taken over the Noon timeslot that was scheduled to feature the Nova Pro Wrestling card, which is now off. In its place, GCW is promoting “Orange Cassidy is doing something or whatever…” and will be honoring tickets purchased for the Nova card. The new show will feature the previously announced match between Shinjiro Otani and Jonathan Gresham. **A-Kid has been added to the Spring Break Part 1 card on Friday, April 5th at 8 pm at the White Eagle Hall in Jersey City. Both Spring Break cards are sold out with a second part on Saturday night at Midnight at the same venue. **Ring of Honor has announced that Flip Gordon will return at the Road to the G1 Supercard show on Sunday, March 31st in Baltimore at the UMBC Event Center. That card will feature Rush vs. Tracy Williams, Mark Haskins vs. Silas Young, and Kenny King vs. PJ Black. **Impact Wrestling has announced that this Friday’s television taping at St. Claire College in Windsor, Ontario is sold out. They are also running the venue on Saturday with the second night of tapings. This weekend’s tapings are the last ones before the Rebellion pay-per-view on Sunday, April 28th in Toronto. **Dave Meltzer at the Wrestling Observer site is reporting that UK-based wrestler Sadie Gibbs has signed with All Elite Wrestling. **Canadian wrestler Josh Alexander, who just signed with Impact Wrestling, has announced he is opening a wrestling school. The Canadian Strong Style Wrestling Academy will be based out of Schomberg, Ontario with classes beginning April 15th for new and experienced students. **The WWE stock closed at $90 on Wednesday. **On this date in 1994, the World Wrestling Federation produced one of the best shows in company history up to that point with WrestleMania 10 from Madison Square Garden. The show was highlighted by two extraordinary matches with Owen Hart defeating Bret Hart in the opening match while Razor Ramon defeated Shawn Michaels in their famous ladder match. While the ladder match concept was taken to exceptional heights beyond that version, the WrestleMania match was influential to a generation of wrestlers, who would take the ladder match to new levels. The booking of the Hart feud was tremendous and laid the groundwork Bret’s rematch with Owen, losing in the opener and coming back to win the WWF title from Yokozuna in the main event. **On Wednesday, TJ Dillashaw posted a statement on Instagram announcing that the New York State Athletic Commission (NYSAC) had found an “adverse finding” in his drug test after the fight with Henry Cejudo in January. Dillashaw said he was voluntarily relinquishing the UFC bantamweight title as a result. It was later confirmed by ESPN’s Ariel Helwani that Dillashaw has been suspended for one year and fined $10,000 by the NYSAC. The suspension is retroactive to January 19th, which was the night of his 32-second loss to Cejudo in Brooklyn. The test was administered to Dillashaw on January 18th, the day before his fight with Cejudo. Under the new USADA policy, they do not reveal when a fighter has been flagged and it was Dillashaw voluntarily disclosing the news about the finding in his drug test. The substance found in Dillashaw’s test has not been disclosed. To all my fans, I wanted to be the first one to let you know that USADA and the NYSAC have informed me of an adverse finding in a test taken for my last fight. While words can’t even begin to express how disappointed I am at this time, please know that I’m working with my team to understand what has occurred and how to resolve this situation as quickly as possible. Out of fairness and respect to the rest of my division, I’ve informed the UFC that I’ll be voluntarily relinquishing my title while I deal with this matter. I want to thank all of you in advance for the support. It is too early to know how the vacant championship will be decided. In theory, Marlon Moraes should be fighting for the vacant title and I don’t think there is an argument against that notion. The interesting part will be if Henry Cejudo is offered to fight for the vacant title and what that could mean for the future of the flyweight division if the champion moves up to fight for the bantamweight title. **Ariel Helwani spoke to TSN’s Aaron Bronsteter about the news involving TJ Dillashaw and his decision to relinquish the title. **Dave Meltzer at MMA Fighting looks at the winners and losers of this week’s announcement that ESPN+ has become the exclusive U.S. distributor of UFC pay-per-view events. The figure that ESPN+ is paying the UFC for exclusivity is unknown but Meltzer reports that according to those in the industry, the figure is in line with the UFC’s revenue off pay-per-view from the past several years, which Meltzer noted was approximately $185 million in 2018 based off an estimated 5,515,000 buys on pay-per-view. Based on 13 pay-per-views, that averages out to 424,200 buys per show but also includes the UFC 229 figure of 2.4 million buys. If you remove UFC 229, the average falls to 259,600. **Following a report from ESPN, the UFC has confirmed that Donald Cerrone will fight Al Iaquinta in the main event in Ottawa, Ontario on Saturday, May 4th. After moving up to welterweight in 2016 and going 6-4, Cerrone returned to lightweight this past January and defeated Alexander Hernandez for his second consecutive victory. Iaquinta has won 6 of his last 7 fights dating to September 2014. The lone blemish during that stretch was against Khabib Nuramgomedov at UFC 223 last April that Iaquinta accepted on 24-hours’ notice when Iaquinta was scheduled to fight Paul Felder on that card and ended up in the main event for a title fight after Max Holloway was pulled from the fight by the NYSAC. Iaquinta rebounded after the loss to Nurmagomedov with a unanimous decision over Kevin Lee last December. **Todd Martin at Sherdog analyzes the UFC-ESPN+ deal and other options this could open up for consumers. **The Democrat and Chronicle reported that the main event of the UFC’s Fight Night event in Rochester, New York on May 18th will be a welterweight fight between Rafael dos Anjos and Kevin Lee. Following a loss to Al Iaquinta, Lee is moving up to welterweight for this fight. Dos Anjos moved up to welterweight himself in 2017 and won his first three fights at the weight class but is coming off decision losses to Colby Covington and Kamaru Usman over the past year. **UFC heavyweight champion Daniel Cormier turns 40 years old today. This was the original deadline for Cormier to retire but has relaxed that deadline. Robbie Lawler turns 37 years old today. John Pollock is joined by ESPN’s New York Ric to chat about TJ Dillashaw relinquishing the 135-pound title, UFC-ESPN+ deal, Jorge Masvidal, UFC welterweights, Michael Bisping & more. John Pollock is solo this week and reviews this past week’s editions of Total Bellas, Being the Elite, Impact, MLW & Road to Double or Nothing. John Pollock is joined by guest co-host Brian Mann to review SmackDown with Kofi Kingston running the gauntlet, the build to WrestleMania & lots more. John Pollock is joined by guest co-host Garrett Gonzales to review Raw in Chicago, Kurt Angle’s retirement opponent, the massive UFC-ESPN+ deal and lots more. John Pollock is joined by WH Park for a special bonus show as the two go through this year’s Wrestling Observer Newsletter Awards for 2019. On this edition of The Rocky Maivia Picture Show, Nate Milton welcomes Paste Magazine Editor Garrett Martin & Political Science Professor Kris Ealy (“The Twenny Twin-Twin”/”NWA: Nubian Wrestling Advocates”) into the theater to review 2004’s Walking Tall! John Pollock is joined by Mike Murray for a complete rundown of Ring of Honor’s 17th Anniversary card from Friday night in Las Vegas, Nevada. John Pollock chats with ROH’s Ian Riccaboni ahead of their 17th Anniversary card and discuss the roster changes, re-signing with the promotion, MSG & more. John Pollock & Wai Ting review WrestleMania 26 from March 2010 with The Undertaker vs. Shawn Michaels and Bret Hart vs. Vince McMahon. Braden Herrington and Davie Portman are back to review this week’s WWE NXT with the semi-finals of the Dusty Classic Tag Team Tournament & more.